The Frog Street AIM online observational assessment tool allows teachers to assess progress, deliver differentiated instruction and monitor progress easily and accurately. Designed for children from birth to age 5. Teachers assess where the child is performing using age-appropriate learning progressions. Differentiated instruction, to both intervene and enrich, is offered to support each child’s growth path. Reports provide precise, reliable data on each child’s progress, class averages, and district summary. Frog Street AIM provides analytical reports to inform all stakeholders of the child's progress... SO CHILDREN SUCCEED! AIM for Achievement. Contact Frog Street Today! MADSEN Alpha OAE is a handheld hearing screener for students of all ages. Designed to meet the minimum requirements for hearing screening. The large touch screen; pictured below, is intuitive and simple to navigate. A built-in probe check cavity ensures testing accuracy by allowing the screener to check the probe in an instant. MADSEN Alpha OAE even incorporates an engaging “cartoon” designed to reduce squirming and fidgeting during the testing process. MADSEN Alpha OAE is DPOAE only. It includes a single protocol and a predefined pass/refer criteria that will produce results in seconds. This device has the capability of storing up to 50 tests. An optional label printer is available. navigation MADSEN Alpha (OAE) Select the Test Ear. The speaker check and calibration will begin. If probe fit is acceptable, the test will automatically begin. The Region VII Head Start Association has created an awareness campaign to help support programs’ efforts to ensure an environment of love and safety for children, families, and staff. With full support of the Office of Head Start, we have created a collection of visual reminders to be displayed prominently throughout Head Start and Early Head Start programs, as well as the community. Family. Friends. Health. Future possibilities. These are a few things that make each new day an exciting opportunity for me. Hopefully you have a list of what makes your day special, too! I want to take a moment to thank our contributors whose stories and contributions crafted this issue into a wonderful picture of who Region VII Head Start is, and the lasting impact your dedication has on the community. From outdoor classrooms, to working with and honoring U.S. Military Veterans, this issue has it all. As you read the inspiring stories in this issue, I encourage you to take a moment to reflect on the importance of what you do each day. I also want to thank our dedicated business partners who chose to invest their marketing dollars in the production of this publication. They too, believe in what you do, and they want to be a part of it. Their ongoing support of Region VII Head Start makes this powerful publication possible, by offsetting much of the production cost associated with the copy you are holding right now, and the hundreds of copies making their way around the region and nation. I encourage you to reach out to these wonderful organizations and learn more about the products and services they provide to Head Start programs. Sip All Day — Get Decay! If you have an idea for a story for a future issue of the Sand Box, please let us know! We would love to hear from you. Contact us at: R7HSA, 312 SW Greenwich Dr., Ste. 105, Lee’s Summit, MO 64082 Phone: 816.550.6388 Email: mikebaugher@r7hsa.com | R7HSA.com The Region VII Head Start Sand Box™ Magazine is published by Region VII Head Start Association. Articles and advertisements do not necessarily reflect R7HSA’s opinions. No portion of this magazine may be reproduced in any form without written consent. R7HSA does not assume responsibility for statements made by advertisers or editorial contributors. 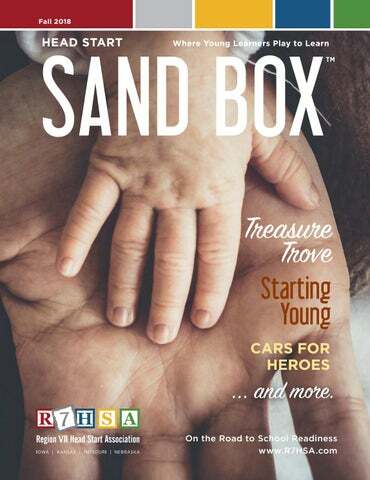 Information in the Region VII Head Start Sand Box™ Magazine is gathered from sources considered to be reliable, but the accuracy of all information cannot be guaranteed. n 1987, I began to receive treasures from Head Start children. The first treasure I thought to save was a little card signed by Tiffany. Her mom said that Tiffany told her what to write. Tiffany wanted to sign it herself. With my heart full, I thumbtacked it to a tacky corkboard above my desk. After that, I started saving pictures that children drew “just for you, Ms. Cheryl” in the classroom or on home visits. They started on my corkboard, then moved to a file, and finally to a box. Among my favorites of many saved were: “Our Playground” by Troy, age 3, and Nathan, age 4 (drawn after a new playground was built by Kiwanis), “A Boat in the Sea” by Kyle, age 4 (he liked to go fishing with Grandpa), “A Self-Portrait” by Jennifer, age 4 (she really did have long eyelashes! ), and “Our House” by Shawn, age 3 and his sister Jody, age 7 ( On a home visit, we always included everyone!). After I became Education Coordinator, I used my treasures often in training with teachers and home visitors. Though I didn’t call them indicators or use phrases like developmental progression in the 80’s and early 90’s, we could see how details change as children grow and have more experiences in life and with materials. We didn’t have an Early Learning Outcomes Framework to tell us what was next, but we had real life examples and experiences to show us. I didn’t call my collections “work sampling” or the files “portfolios” back then. They were, however, a Treasure Trove. Now that I’m working more with data and outcomes, I sometimes feel removed from helping children and families engage successfully. But every so often, I take out my Treasure Trove…and Tiffany, Troy, Nathan, Kyle, Jennifer, Shawn, Jody, and many more—I will never forget you! lush raised bed gardens where children are able to get hands-on experience growing fruits and vegetables, as well as numerous themed sections including music and movement and nature art areas. Dimensions Educational Research Foundation led the process of designing and constructing the outdoor classroom using input from teachers and children along the way. Dimensions also brought in additional partners, Community Health Endowment of Lincoln and Campbell’s Nurseries, to bring the vision to life. Kind volunteer groups from various local businesses spent many hours during the hot summer months assisting with installation. “The completion of our beautiful new outdoor classroom is a reminder of the important role community plays in preparing our children for success,” expressed Vi See, Executive Director of Community Action. “We thank the donors and volunteers who gave of their time, talents, and financial resources to give our children not just a great new space, but an opportunity to learn and develop to their fullest potential.” Community Action Head Start is fortunate to have a supportive community that supports the learning and development of its enrolled children. For more information about Community Action Head Start, visit www. communityactionatwork.org. Juli Bretz greets a family arriving to school at Jesse Franklin Taylor. Juli loves working with her team to support families and is part of a powerful Head Start team at Des Moines Public Schools, serving 420 Head Start families, as well as 1,400 other preschool students. Recently, Juli attended training on leading a Health Care Institute and looks forward to leading that with families this school year. Melissa Leyen, the Head Start Coordinator at Des Moines Public Schools says, â&#x20AC;&#x153;Juli is such a perfect fit for our program because of her strong background working with young children and families. They are her passion. You can see it every day when she stands at the front door and greets every single parent, student, or staff that enters. Juli is always optimistic, upbeat, and ready to help anyone in any way she can. We are extremely fortunate to have Juli in Head Start.â&#x20AC;? Bretz helps a Head Start child learn to use his new inhaler. hen high-quality child care is accessible, parents can go to work with peace of mind—knowing their child is safe, happy, and receiving support that will prepare them for success in school and beyond. However, with many communities facing extreme child care shortages, accessing high-quality care can be difficult. For many parents, even when they can find a program that meets their needs, paying for it can be a serious challenge. In Wyandotte County, Kansas, The Family Conservancy (TFC), a nonprofit serving at-risk children and families throughout the Kansas City Metro area, has launched a three-year pilot project called Start Young. Start Young will address some of the most difficult child care-related challenges—the affordability and availability of care, the retainment of teachers, and the quality of programming. “We are very excited to embark on this transformative project for Wyandotte County. Currently, the county only has the capacity to meet 40 percent of the child care needs of working families with young children. Many of the programs that are available do not meet working families’ needs for full-day, full-year programs. “Start Young will address these immediate concerns, and it will do more than that,” said TFC president and CEO Dean Olson at a recent press conference for Start Young. MAKING CHILD CARE WORK The child care industry is often misunderstood. Judging by the price tag many parents pay, it’s understandable to assume the market is lucrative. However, even at the most basic level, child care is a labor intensive and costly service to provide. The high-quality care children need is even more expensive. For many families, it’s outright unaffordable. “Many providers, especially those serving low-income families face a difficult dilemma. Parents cannot afford to pay the true cost of care. Providers are forced to cut corners to reduce rates. This often results in low teacher pay, high staff turnover, and many other issues that prevent programs from providing the high-quality service children need,” explained Olson. The child care programs who have signed on as Start Young partners serve children from families with low incomes. These families rely on the state subsidy for their child’s care. While subsidy helps, there is often a significant additional expense, and many families are not able to pay the difference. Centers are faced with a difficult dilemma—providing care at the subsidy rate, often at a loss, or refusing children and facing the resulting unfilled openings. Over the course of three years, Start Young will address these issues while improving the quality of child care. The program will create new child care spaces, provide salary supplements to teachers, and improve the quality of existing programs by providing professional development and coaching to teachers and administrators. The project will also help families afford care by helping them access the state child care subsidy and providing partial scholarships. A COLLABORATIVE APPROACH TFC will lead the project, but it’s far from an individual effort. In addition to the community child care providers, many of which are also Head Start providers, there are five direct service partners committed to the project: Mid-America Regional Council, United Way of Wyandotte County, USD #500, Juniper Gardens Children’s Project, and Child Care Aware of Kansas. Funding for Start Young is provided by Kansas Children’s Cabinet and Trust Fund through Communities Aligned in Early Development and Education and matched with funds from the private sector. Nancy and her granddaughters standing beside their new vehicle. elfless...a word I rarely use, but in this case, there is not an adjective more fitting to describe this woman. Unfortunately, challenges have never come sparingly for Nancy. Throughout the years, she has experienced some of the most testing, heart wrenching, and life-altering situations and has still found a way to remain positive. Shortly after getting married in 1976, Nancy’s late husband joined the United States Navy in California. Beside him she stood, supporting him through his journey and tending to the family they lovingly created together. As a unit, they resided on base with their four children, two boys and two girls. For about the next seven years, her husband served honorably. As the years passed and the children grew, Nancy eventually obtained a job when they moved to Leavenworth, KS at a local bank. For the past 141/2 years, she was a dedicated customer care employee when suddenly Nancy’s life took a turn. She learned that her beloved daughter lost her life. As you can imagine, this tragedy was anything short of horrific. Staying on her feet, Nancy picked up the pieces and stood tall to be strong for her family. Her granddaughter (late daughter’s child) continued to reside full-time with Nancy as she had for her entire life (age 9). Shortly after, Nancy was hit with yet another catastrophe, the death of her second daughter. Not only did she lose a daughter, but another young child was left without a mother. Without hesitation, Nancy rushed to become a temporary foster parent for her infant granddaughter, Jada. Upon receiving temporary custody, Jada was diagnosed with two ear infections. Several trips to the doctor and substantial time missed at work resulted in Nancy being let go from her hardearned position at the bank. Job searching had to be put on the back burner as Jada’s ears were still of concern and had failed to improve. Eventually, tubes were placed into Jada’s ears and she was left with some hearing loss. Despite having lost two daughters and a job all in the span of 18 months, Nancy once again stayed strong. Not only does she raise Jada and help raise her other granddaughter every other weekend, she also cares for her elderly mother who resides in the home as well. Not for one moment has Nancy stopped fighting to keep her family together and well taken care of. When she expressed to me that her car had finally conked out, I instantly wanted to help her. Nancy desperately wants to get back to work so she can start providing for her granddaughter. A donated car would not only help her job search and meet basic needs like grocery shopping, as she relies on neighbors now to take her, but it would also ensure that Nancy could get Jada to her doctor’s appointments with her otolaryngologist who is located in Lawrence. Jada’s health is incredibly important (especially to Nancy) that I would hate to see it slip away due to inadequate transportation. Now is the time for someone to help Nancy as she has always helped others. Diligent, altruistic, supportive, and optimistic are just a few attributes that suit Nancy. I hope you will consider Nancy as an ideal candidate for Cars 4 Heroes. Please help me lift some weight off of her “oh-so-heavy” shoulders! called Nancy up on stage and, along with Terry, awarded her keys to her new vehicle. As you can imagine, Nancy was shocked and overwhelmed with gratitude. About a month has passed since Nancy received her vehicle and she is still in shock. Theresa Zaruba has visited with her about the changes that her new vehicle has made in her life. She stated that, “It gets us where we have to go.” Nancy spoke about how nice it is to know that she will always have a ride where she needs to go without having to depend on others. Something as simple as a trip to the grocery store no longer feels like a burden to Nancy. She is able to hop right in the car and drive to the store when the family runs out of milk, or is missing ingredients for dinner. “I’m not big on asking others for help; the car is a wonderful blessing,” Nancy said as she followed up with how wonderful it is that Jada is always able to make it to her doctor’s appointments. Health can be a priority for the family without it being a struggle to get from point A to point B. Nancy is also able to pick up her other granddaughter from school so she does not have to walk over a mile home every day. She expressed to me that she has been wishing she could do this for a long time now, and it tickles her to know that she finally can! much sugar and calories as soft drinks. Extra sugar consumption has been linked to high levels of obesity, cavities, asthma, and risk factors for heart disease later in life. What are sugary drinks doing to your child’s teeth? Drinking juice, soda, or sports drinks may help wash down a meal or help quench your thirst, but they leave unwanted sugar behind on teeth. Tooth decay is caused by bacteria in the mouth using sugar from foods and drinks to produce acids that dissolve and damage the teeth. Each acid attack lasts for around 20 minutes. Every time you take a sip of a sugary drink, the acid attack begins all over again. Fun and easy ways to get kids to drink more water There is a growing number of early childcare programs making drinking water always available to young children to drink whenever they wish. The goal is to increase water consumption each day and reduce children’s dependence on juice or sweet beverages for hydration. Kansas City Kansas Community College’s Child Care Center, for example, offers water in pitchers at every meal, allowing the children to pour it themselves. While at school, some children drink two cups of water at the meal and have water fountains available at all other times throughout the day. Here are tips for encouraging children to drink fluoridated water during the day. • Make it fun: Drink from single-use bendy, silly, or colored straws, or children can choose their favorite cups or water bottles. • Keep it portable: Water bottles that can be carried anywhere and refilled with tap water are great. • Flavor it: Children used to drinking juice, juice drinks, or pop (soda) may think water is too plain. Add a lemon, lime, orange slice, or fresh mint leaves to the water. Or add fruit like blueberries, raspberries, or strawberries. • Ice it: Serve water with ice cubes or crushed ice. Look for ice cube trays in fun shapes like dinosaurs, letters, or animals. • Make it available: Set up a station where children can get a drink of water whenever they are thirsty. It can be as simple as keeping a non-breakable water pitcher on a low counter or a chair where young children can reach it. • Model it: Young children learn by watching. Be a good role model by drinking water instead of drinks that have sugar. Feel free to enjoy the occasional sugary drink as a treat. Here are some ways to reduce the amount of sugar in beverages that children and their families are drinking: Plain white milk can be a healthy option at meals, but flavorings add a lot of sugar. Look at the packaging on juice to make sure there is no added sugar. If you are in a fast food restaurant, ask to replace the default sugar-sweetened beverage with water. Give your child a water bottle to take to day care or preschool that they can refill throughout the day. When other people look after your child, such as grandparents or babysitters, ask them to give your children low-fat milk or water rather than other drinks. Be creative and come up with some other fun ideas! Helping children make smart choices early on will result in a longer life with good oral and overall health. SCICAP Head Start is working hard to ensure that we are working with and benefiting the military men and women currently serving, as well as supporting veterans in our five county areas. This year, we are noticing that we have more military veterans who are filling out applications for their children. We would like to share about one of those military veterans whose family we are currently serving. Before school started, we had the privilege of taking an application for a disabled veteran who had returned to his hometown after deployment to find himself homeless and parenting his two young daughters by himself. Shelby brought his oldest daughter in to sign her up for the program. He was very well prepared, and throughout the application process, we were able to see the amazing bond he shares with his daughter. While his daughter played with various toys, he was able to get the application completed, along with the other necessary paperwork for us to complete the application. Shelby is a thirty-five-year-old male who happens to be a veteran dealing with Post Traumatic Stress Disorder (PTSD) from serving overseas. He also has some physical disabilities to overcome resulting from various tasks he performed while overseas. He remembers all the grueling jobs he has had to do and admits that being in the army is definitely not easy on the body. Shelby enlisted in the army on September 18, 2012. Six short months later, he had graduated from basic training, and his unit was then stationed in Texas. In 2014 and 2015, Shelby served overseas in Sinai. Shelby’s wife was pregnant with their oldest daughter at the time of his deployment. When Shelby returned home from serving, his daughter was three months old. He reflects on the first time he held her saying, “My daughter was three months old before I even got to touch her.” Shelby’s second daughter was born ten months after he returned home, and she was two months premature. Shelby — U.S. Army Veteran and Head Start Dad. Shelby likes having his parents close by for added support, and he loves having his children build such a close relationship with their grandparents. Shelby puts his two daughters first and is doing everything possible to give them a head start in education so that they will be school-ready by kindergarten. Shelby is very happy with Head Start and states that when his youngest daughter is ready to enter pre-school, he wants her to attend Head Start. Shelby states the application process is easy and Head Start is very accommodating to his needs. He exclaims, “It has been great!” Shelby mentioned that he feels like he is welcome to help with things at the site whenever he can. He has helped one of our teachers change the light bulbs in the classroom and is eager to continue to help at the site whenever needed. OACAC staff cut the ribbon to open the new center. Photos courtesy Bolivar Herald Free Press. JC Meador was a successful businessman and quiet philanthropist. Community Members Ribbon Cutting: Community members tour the new facility during Bolivar Broadway Head Start’s ribbon cutting. J.C. Meador believed in the importance of giving back to the community and helping to make sure children had what they needed in order to be successful. 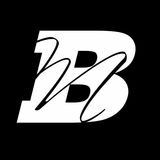 His values aligned with OACAC’s mission, making the project a perfect partnership. After his passing earlier this year, Mr. Meador’s family honored his wishes and completed the project. “I think he (J.C. Meador) would be incredibly proud of how everything turned out and I’m really grateful to his family and to him, and I’m sure we’re going to honor his legacy by providing exceptional services to children and families in this location,” remarked ShinnBrown. Meador Family Ribbon Cutting: OACAC Head Start staff pose with the Meador family during the ribbon cutting. Pictured are, from left front row – Sara Lipsey, Mollie Carr, Jill Pierce, Martha Gilliam, Arlene Wrinkle, and Timi Heaton; back row – Diane Bauer, Kimberly Shinn-Brown, Teresa Dickey, Carl Rosenkranz.